The Algae are a morphologically and phylogenetically disparate group, united by the shared possession of a photosynthetic pigment. This pigment is derived from an ancient endosymbiotic event, in which a cyanobacterium was engulfed by another cell. There are three major groups of algae - green, red and brown - and each group originated from a different endosymbiotic event. The green and the red algae evolved from 'primary' endosymbioses, where a cell directly took up a cyanobacterium. 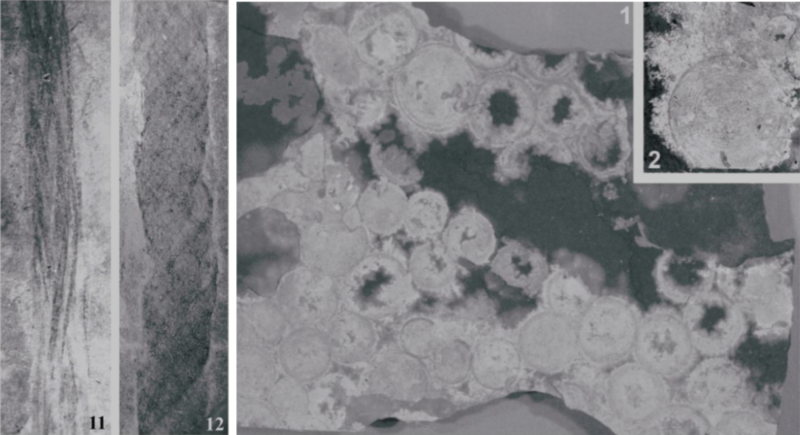 In contrast, the brown algae evolved from a 'secondary' endosymbiosis, where a red alga took up additional cells. Within these three groups there exists a huge variety of different forms, ranging from the unicellular chlorella (green), dinoflagellates (red) and diatoms (brown), to the giant seaweeds (green and red) and kelps (brown). The Ediacaran Period was a formative time in the development of this morphological diversity, and several algal fossils are known from Ediacaran microfossil and macrofossil localities. An example of the diversity of modern algae, from top left: green, brown and red macroalgae, as well as diatoms, microscopic brown algae. WE NEED A REFERENCE FOR THIS - IS IT PUBLICLY AVAILABLE??? The known algal fossil record extends back to the Mesoproterozoic, with perhaps the most famous early alga being Bangiomorpha, a supposed Bangiale red alga (Butterfield, 2000) found in 1200 million year old rocks. We only start to see the beginnings of the morphological and phylogenetic diversity so characteristic of the algae today in mid-Ediacaran assemblages. Left: Bangiomorpha ( figure adapted from Butterfield 2000) Right: Doushantuo red algal reproductive structure, carpospore (figure adapted from Xiao et al., 1998). ​The Doushantuo finds did not uncover many prospective members of the green algae, which was perhaps surprising given that supposed early green seaweeds (Ulvophycae) had previously been documented from rocks dating from 750-700 million years old (REF). However, the discovery of the Lantian biota (Anhui province, China) has changed this. As well as documenting the continued presence of both red and brown algae, such as forms similar to the modern kelp Postelsia palmaeformis (Yuan et al. 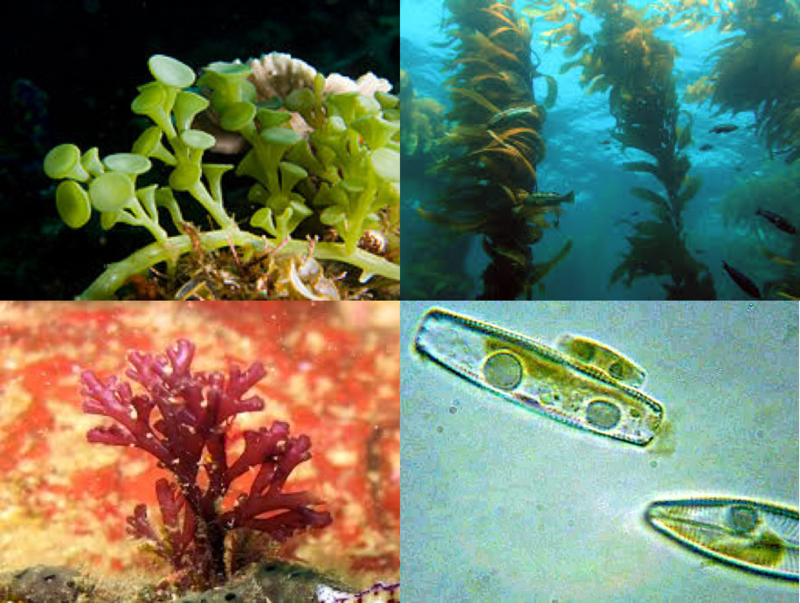 2011), many more prospective members of the green algal seaweeds, the Ulvophycae, were also recognised. One of the most famous of these is Liulingjitaenia alloplecta, which appears in both the Lantian and the later Miaohe assemblages. Liulingjitaenia was a long, thin, tubular algae that has been compared to the Siphonaceous green algae, and it has recently been recognised in South Australia too. The Miaohe biota (Hubei province, China) is significantly younger than the algal fossils discussed previously, having been dated to around 551 million years ago. Like the Lantian, there is a huge morphological variety here with fossil groups thought to constitute the green the red and the brown algae, and all manner of morphological variations therein. Widely discussed members of the Miaohe biota include the circular impression Beltanelliformis brunsae, which has been compared to the gametophytic life phase of the Caulerpalean green algae Derbesia (Xiao et al. 2002), although it has more recently been considered a colonial cyanobacterium (reviewed: Ivantsov, et al. 2014). Most Ediacaran algal fossils, like the Lantian and Miaohe biota, are preserved as carbonaceous compressions, in a style that appears very different to that seen for most Ediacaran macrofossils. However, recent discoveries in South Australia reveal the same algal taxa found as compressions in China, but instead preserved as cast and mould impressions in sandstones (i.e. in the same style as the classic Ediacaran fossils). Algae are noted in the latest Ediacaran, but they often appear to comprise only a small proportion of bedding plane assemblages. This is evident in the shallow marine strata of the Ediacara Member of Australia (Xiao et al 2013), where algal fossils characteristic of the South China deposits such as Liulingjitaenia (also found in the Khatyspyt Formation, Siberia - Grazhdankin et al. 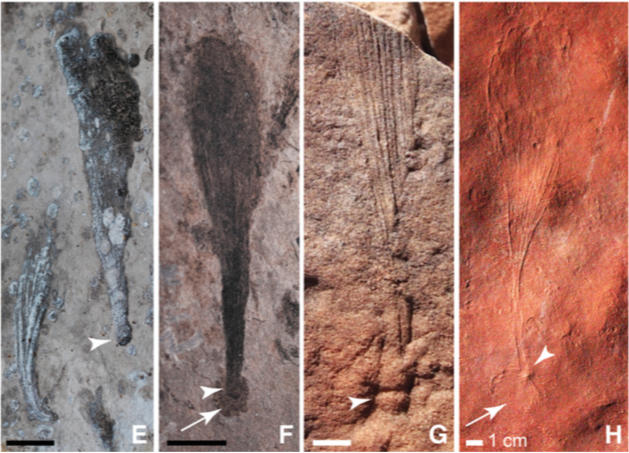 2008), Beltanelliformis and Flabelophyton are found contemporaneous with classic Ediacaran fossils such as Kimberella, Dickinsonia, the Rangeomorphs and the Arboreomorphs. As such, although they are often overlooked by palaeontologists, algal fossils should be considered as integral parts of the Ediacaran marine system, and they warrant further study.